*When I’m Bad I’m Better 2* BOOK RELEASE & CONTEST! Things went from better to worse the last time we heard from these four cousins, and now six months later, some things in their lives are still in shambles. Valerie, Vanessa, Amina and Yasmin are far cries from the good girls they once projected themselves to be, and this time around, they’re owning it. But change isn’t always good, and if you thought things were bad for these four ladies before, you haven’t seen anything yet! Email a screenshot of your “WHEN I’M BAD I’M BETTER 2” book review on AMAZON to INFO@KFJOHNSONBOOKS.COM before DECEMBER 31, 2018 For your chance to WIN! Is An Author Who Reviews Books Jeopardizing Their Brand? Reviews! All authors want & need them to gain & maintain a following for their work. Knowing the importance of book reviews, most authors who read, also tend to leave reviews. But could leaving a review for another author jeopardize your brand? Face it. A lot of authors are just like any other artist, “We’re sensitive about our sh*t!” Of course, most, if not ALL authors think the verbal babies they’ve birthed from the depths of their soul’s imagination deserve 5 star reviews. Why would anyone bother to publish a book if they thought anything less of it, right? Many authors are also avid readers and may have even become authors because their love of reading inspired them to write too. Because some authors can be fickle, or dare I say PETTY…attaching your name to a not so flattering book review could unwittingly put your own work at risk. Vindictive authors may seek out your work and rate it poorly as a form of revenge. Readers & other authors may see your review as too harsh and/or think you feel your work is superior. Networking within the publishing industry is very important and you can create bad blood without even knowing it. Even when posting good reviews, readers and other authors may see your perspective as biased. For these reasons alone, I would suggest using an alias when leaving book reviews on book retailer sites, social media, or even on your personal blog sites. Remember that when you are reviewing a book you’ve read, you’re just another reader; and your reviews should be seen as such. To Be or Not To Be with a Publishing Company? I’m sure this is a dilemma many independent authors find themselves tackling with and I’m unsure whether I want to stay on my own for now or join a publishing company. My books have being doing fairly well considering that I came in it with the sole intentions of my friends reading my first book Behind Closed Doors and it took off. After making some buzz on Amazon and getting into their top 100 list multiple times even making #1 a few times in its genre and topping out at #8 the most consistently, I decided to create a website KFJohnsonBooks.com and write a sequel named Liar’s Ball. Considering that I was a newlywed at the time and we were also purchasing a new house, my promotions for my 2nd book faltered a bit, but I still created a few marketing pictures, posted links and made appearances on some blog radio shows which kept the buzz going. THIS year however; after releasing my 3rd book, When I’m Bad, I’m Better, I decided to promote my books and everything K.F. Johnson, full steam ahead! That included big marketing campaigns, book signing appearances, traveling for appearances and sales, attending author shows, awards and conventions, being more interactive on social media, etc. Gratefully, stepping up my game has garnered me a decent amount of sales, a respectable amount of reviews on Amazon, Goodreads and other websites (between 33-85 reviews per book), a growing readership and numerous invitations to do more. With this, it’s put me on the radar for more publishing companies than I was previously. Signing with them will “legitimize” your works value and their staff can assist in ensuring you’re putting out quality books. They will do the administrative and financial contracting for your books by placing them in the correct genres, establishing your royalty percentages, assigning books ISBN, AIN#’s, etc. Locations for distribution are expanded to shelves in book stores, libraries, numerous online stores including their own, etc. They have creative control over everything and can make decisions about your cover, the direction of your books, the description, the title and the format with or WITHOUT your consent in some cases. They would have control over movies, audio books, etc. concerning your works and making those deals OR NOT. Advances, if received, are given in expectation of sales and are deducted from royalties. If a book isn’t properly promoted, doesn’t sell well or the publisher discontinued print, that money is all you will receive. What if I discover that I sold more books or made more money when I was on my own? Some of the author’s/books under a few publishing companies that have approached me didn’t appear to be doing any better than I’m doing on my own. Some publishing companies want you to also have a separate agent. Is that something I want, need or can afford? Contracts are hard to change or break once you’ve entered into it. Sooooo…with all of this being said, I’m still unsure as to what the best route is for my future. Maybe I just haven’t come across the right publishing company yet or maybe I am best off staying an indie author. I don’t know. What do you think? Are you an indie author or with a publishing company? Authors! Could GOODREADS.COM be the key to getting your GOOD READ advertised? If you love to read books and/or are an author, you are probably a member of http://www.goodreads.com right? If not, you need to go ahead and sign up right now. It’s basically a facebook for readers and writers and if I’m not mistaken, Amazon has recently purchased them and has some sort of link with marketing. Anyhoo, Goodreads is where you can find a plethora of readers over every genre you can imagine and you will have access to them at your finger tips for free and paid advertising. Not to mention the access you and your readers will have to interact in addition to your other social media links. Here’s a few tips on how to use Goodreads.com to help advertise your books and connect to your reading audience. Create your author profile and post/link everything that markets your books and you as an author to that page. 1000’s of readers will now have access to see what you’ve published and what you talk about. You can post videos, links to your youtube channel, author website, book trailers, social media pages, whatever! Create a free book giveaway contest! Good reads will advertise that you’re giving away your book to however many people you notate (1, 2, 3 or whatever # you choose). Then they set up the promotions and you will get hundreds of entries just to win a free book because people LOVE to win free stuff. This can in turn get you new readers who are interested in the book even if they don’t win it based on what they’ve read in the description and who may add your book to their reading list anyway. Win Win! I can certainly testify that each book I did this with garnered a ton of new readers. Try paid advertising. You set the budget and what wording you want to be promoted with your books. If Goodreads approves, they will market it to readers who are specific to your genre, specific to authors you feel have your core audience’s eyes, tag words, or all of them. You select who to target and how much you’re willing to pay for the advertisements. Easy access to book reviewers and to connect with other authors, some of whom you may admire yourself. It never hurts to collaborate with other authors and learn from their mistakes and/or successes. Build your network! I hope these brief tips help you in some way the way they helped me! Anyway, keep a look out for my book WHEN I’M BAD I’M BETTER coming out this fall and feel free to purchase either of my previous releases BEHIND CLOSED DOORS & LIAR’S BALL on Amazon.com! Is procrastinating and self doubt stunting your success? Three years ago I was a few months away from turning 40 years old. I was about to OFFICIALLY be OLD! Of course, like a lot of people when you start feeling like you’re getting old, I started thinking about all of the things in life I wanted to do but didn’t and should have accomplished but hadn’t. I’ve been writing stories since I was a little girl. I wrote stories like the one about “The mouse family adventures” along with full illustrations by yours truly in elementary school, all the way through to fantasy stories about me marrying Ralph Tresvant from the group New Edition in Junior High. In High School my imagination evolved into stories about dangerous relationships, murderous stories and seemingly happy stories that ended with a not so happy twist. In addition to reading books by Judy Blume, Terry McMillan, and Omar Tyree, you can probably thank my love for True Crime books, V.C. Andrews and anything Stephen King for my twisted writing style and stories. After graduation, I developed a story about a brother and sister who grew up in a dysfunctional family and the crazy things they did as adults along with promiscuous and murderous twists. It was taking me FOREVER to complete though because life kept happening and I wasn’t motivated to change my procrastinating ways. That is, UNTIL 2012 when the NAUGHTY FORTIES started knocking at my door. In 2012, I finally finished writing my book and just wanted an easy way to share it with friends. 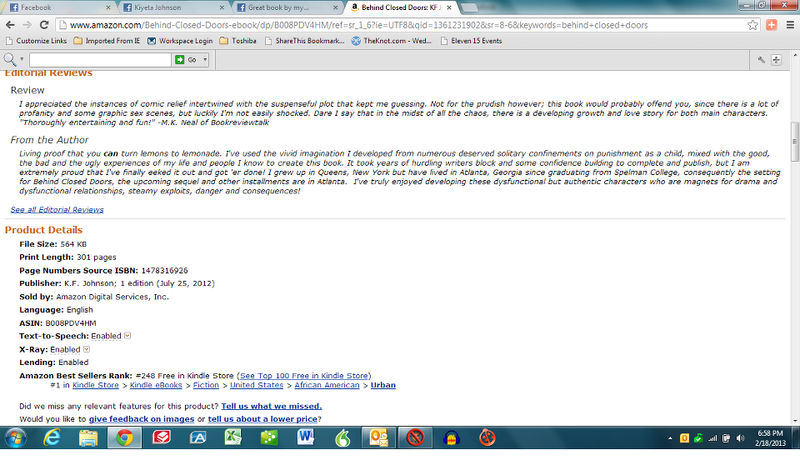 So, I googled it, saw how easy it was to publish a book, and went through the process to uploaded my book to AMAZON. Unbeknownst to my naive mind, EVERYBODY with access to AMAZON also had access to read my book Behind Closed Doors and guess what? A LOT OF PEOPLE LIKED IT! Not only were my friends and relatives giving me kudos for my writing, but so were strangers! Who knew that simply finishing what I started and ignoring doubt would not only result in self fulfillment but some pretty awesome accolades and a little bit of profitability too? Now granted, I did have to go back and have my book edited, because expectations are higher when you know “the whole world” might be reading your work rather than just the people you know. Still, 2012 turned out to be one of the best years of my life and it’s the one where I OFFICIALLY became a published AUTHOR. 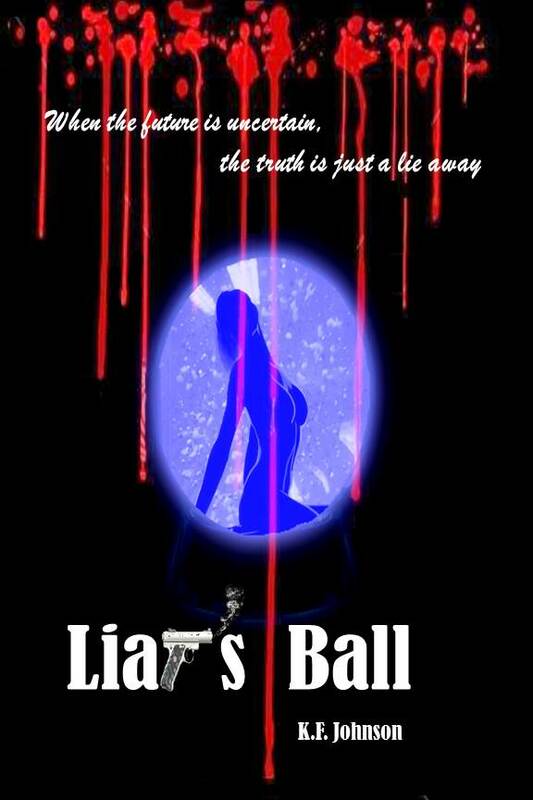 I’ve hit #1 and other high-ranking #’s on Amazon charts multiple times since then with both Behind Closed Doors and with my last 2014 release Liar’s Ball. I’ve been a guest author on many blog radio shows, had my books chosen as the book of the month for a number of book clubs and am in the process of penning my 3rd book for a late 2015 release as I type this. Sooo…what does all of this have to do with you and procrastination stunting your success you ask? EVERYTHING!!! You may not have heard of K.F. Johnson the author prior to reading this, visited my official website http://www.kfjohnsonbooks.com or read either of my previously released books, but I am still a success! Books I’ve written have been read by scores of people I don’t know but have enjoyed my writing (okay some haven’t enjoyed it but do they really count? Not really…LOL). Do you know why? Because there are THOUSANDS of books on AMAZON that have been read by fewer people than you have fingers and whose authors have an even bleaker presence. The fact that you’re reading this blog post right now is a testament to THAT now isn’t it? So…the moral of the story is, don’t let fear, doubt or procrastination prevent you from being who you want to be or accomplishing what you desire to accomplish. I did something I loved, shared it and received love, success and recognition for it in return. YOU can do the same thing! So I decide to Google my name just to see what pops up. 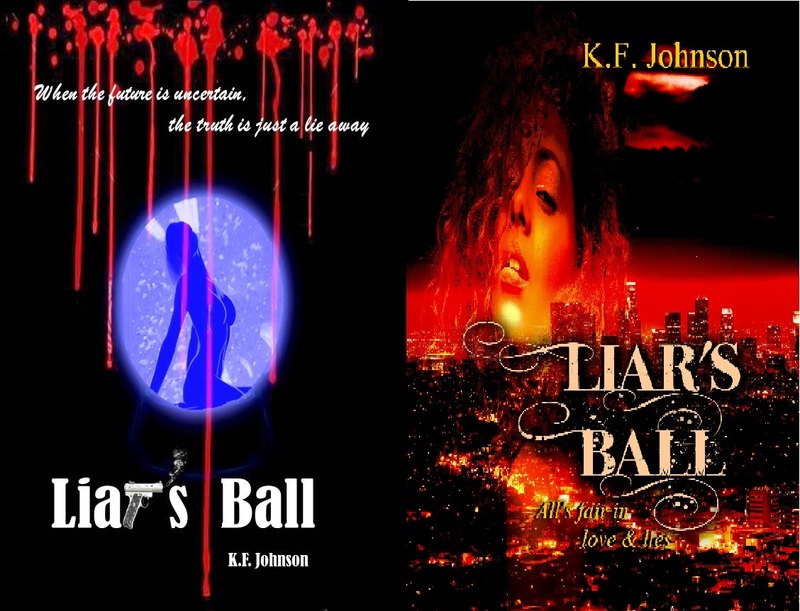 Of course, my website www.kfjohnsonbooks.com, various sites featuring my interviews, book trailers and sites authorized to sell Behind Closed Doors and Liar’s Ball popped up. But something unexpected showed up too. A torrent website offering FREE downloads of BOTH of my books! What the HEEZY?! I didn’t authorize that! That’s illegal! I know you’re asking, “Well don’t you have the copyrights to your books?” Yes it is! I’m a self published author, but I own the copyrights to BOTH of my books and legally, I can sue and pursue anyone who has distributed or sold my work without my consent. While many websites will remove the content after receiving such a letter, there are no guarantees that they will and pirate websites spring up like weeds on a plantation enough to keep some copywriters busy. If you’re not a big wig publishing house or if you don’t have attorney’s at your disposal, you may find the task of getting your material removed easier said than done. This pains me to say but…maybe the infringement is benefiting you and your product sales rather than hurting. Is your book cover saying enough about your book? Okay so every author knows that the book cover is your FIRST form of connecting with a new reader. 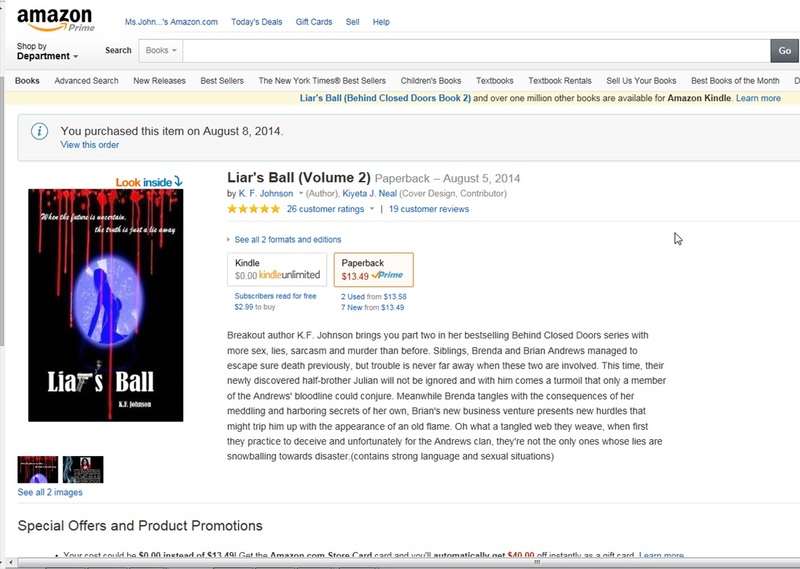 Although I have achieved success with my first book BEHIND CLOSED DOORS & my 2nd book LIAR’S BALL has already gotten a lot of great book buzz, sales & reviews, I still felt like it COULD be doing better. 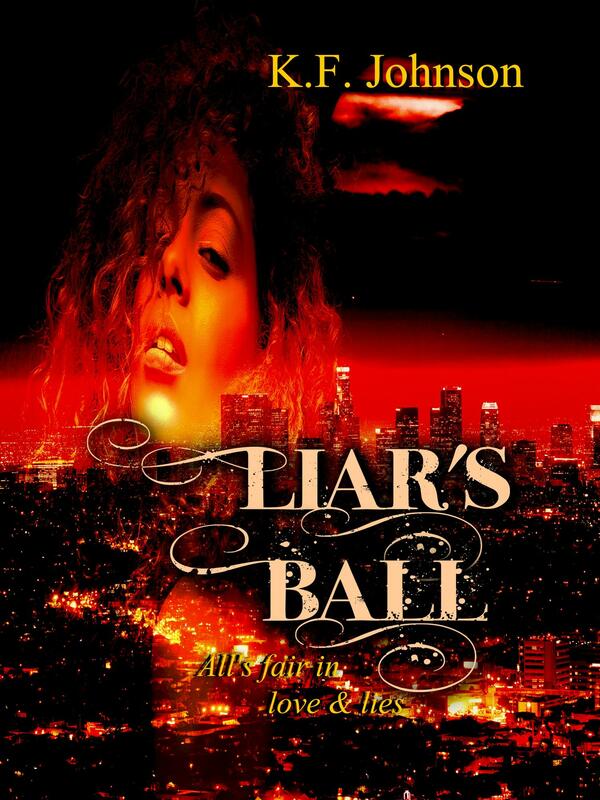 LIAR’S BALL is a fiction novel which follows the lives of 3 siblings in the city of Atlanta and their dysfunctional, sometimes dangerous relationships. I admit that I was feeling pretty confident when my self made book cover produced good buzz and sales (of course along with the great content). That being said, when I began preparing for the release of my second book, LIAR’S BALL, I thought I could produce the magic again. I thought it would be even BETTER than the last cover. The first couple of weeks, sales were rolling like gangbusters, but the more I looked at other covers in my genre and compared them to mine…I started to see the difference. Now I’m sure some people can create GREAT book covers on their own, and depending on your genre, it may even be easier to do. Given that my target market is primarily those that would read Urban/African American books, my genre requires something dynamic in such a saturated market. So here are the flaws I picked out (I wish I’d thought of these things prior to publishing):The figure I used is built more similarly to a Caucasion woman than an African American woman. And, the design looked more like the cover of the next 007 novel than it did about siblings and their dysfunctional and dangerous relationships. So…I have since changed the cover to the one on display. Luckily my book has only been out for 3 months, so re-releasing it now with the new cover gives me another angle to promote and gather new readers. Still, this was clearly another new/indie author pitfall that I had to surpass. When you know better, you do better! At any rate, these are the growing pains of a new author. Have any of you had to change your book cover either before or after release? Do you like the original cover or the new cover? Give your book a boost with a book trailer! In this day and age where people constantly “Do it for the Vine“, watch YouTube and several other video versions of social media, it’s important for authors to tap into this resource for marketing our books and ourselves as well. Now if you’re an indie author like myself, your money is not as long as some publishing companies, so you may be working with limited resources. Furthermore, let me be honest with you…I’m nobody’s computer guru. I have to google almost everything technical in order to figure out how to properly use it. Luckily, I’ve found some pretty easy steps you could take to make your own book trailer if you don’t have the funds, or simply don’t want to hire a professional to create one for you. 2. Windows Movie Maker. A lot of people already have this installed on their computers. Especially if you have Microsoft Office installed, you likely have Windows Movie Maker also. If you don’t have it, no worries! You can download it for free! You can upload pictures, create catchy phrases, or add Giff moments if you choose. It’s just like the title says…you’d be making a little movie! 3. YouTube. You can upload whatever trailers you’ve created from the other sources I mentioned, or simply create your own videos with your phone or tablet and upload it. This works out great if you already have a channel with subscribers to help you get the word out too. Some people like to surf YouTube videos as a hobby. You never know who might see it! There is no set length that a book trailer must be. My advice would be to make it long enough to promote your book and gain excitement, but short enough so that you don’t lose your audience. Have you created any book trailers? Do you have additional suggestions for inexpensive ways to create a book trailer? How did you like my trailer? Does Amazon’s Paperback vs. Kindle Rating System Help Or Hurt Your Book? So since I have a new book out in both e-book & print, Liar’s Ball, I have been monitoring its ratings on Amazon almost daily. Well what do you know? Amazon has an additional rating system for paperback books vs. their kindle e-book versions! Now I don’t know how long this has been going on. Maybe it’s not new and it’s just the first time I’ve noticed it. I never noticed it when I released my first book Behind Closed Doors in 2012, but hey, maybe I just overlooked it. Essentially, it allows people to simply rate the book without having to write a review for paperback copies if they choose not to. On the Paperback side you will see the “customer ratings” & “customer reviews” section under your book’s title, as opposed to only seeing the “customer reviews” section under your Kindle Edition titles. Here’s an example where I have 77 customer ratings & 71 customer reviews under the Paperback version of Behind Closed Doors, but only the 71 customer reviews show under the Kindle Edition. Well now THAT is new isn’t it? Now readers have the option to rate an e-book directly from their kindle or whatever device they use right after they finish reading the book if they choose. Previously, Amazon forced you to write a review to go along with your rating, whether it was going to be 2 words or 200 words for the prolific type, it was required. Now your books can be rated with a little less hassle, but I wonder if this rating ability is going to be used for Kindle Editions soon as well. I’ve already noticed that when I read a book on my Kindle it asks me to rate it at the end. I don’t know if it automatically puts ratings for Kindle books with no reviews into the “customer ratings” section in your paperbacks or what…but I haven’t seen the differentiation on the e-book side. This could be due to Amazon now owning Goodreads.com and maybe they’re also using/or will be using Goodreads ratings somehow on Amazon. 1. What do you think about the customer ratings separation from the customer reviews only showing in paperback versions? 2. Do you think the ease with which readers can now rate a book without explanation will prove beneficial or to the detriment of most authors if it becomes available for Kindle versions as well? 3. Do you think this new easier way of rating will encourage more people to rate Kindle ebooks? Thanks for reading and don’t forget to follow me on social media! Are you a Blogger or Avid Reader That Publishes Book Reviews? Check This Out! If you are a blogger or avid reader that publishes book reviews, if you register with BOOK REVIEW BUZZ, you may be able to receive free copies of new releases to review or get them before they’re available! If you would specifically like to request a review copy of books by K.F. Johnson, please complete and submit the information below along with your request and email it to info@kfjohnsonbooks.com or to kfjohnsonbooks@jproperties.net. We will NOT respond to any requests that do not have full information listed. Buy BEHIND CLOSED DOORS BY K.F. JOHNSON TO WIN J.T. and JAY-Z Show Tickets! GET BEHIND CLOSED DOORS BY K.F. JOHNSON TO WIN J.T. & JAY-Z TICKETS! WIN 2 Tickets to see J.T. & Jay-Z at Yankee Stadium! at Yankee Stadium in New York July 19th or 20th 2013! Buy the PAPERBACK and get ONE EXTRA ENTRY! 1. Sweepstakes participants must have made a verifiable PURCHASE of BEHIND CLOSED DOORS by K.F. Johnson on amazon.com between 5/30/2013-6/15/2013, “liked” our K.F. Johnson Author Fan Page on Facebook , shared OR tweet about our sweepstakes on Facebook or Twitter @KFJohnsonbooks , completed the sweepstakes entry form, and emailed a proof of purchase receipt to info@kfjohnsonbooks.com or posted a verified purchase book review on amazon.com. 3. Posting a verified book review on amazon.com in no way guarantees or disqualifies a sweepstakes winner regardless of the content or rating of the review except where amazon.com has removed the review from their site. All reviews removed by amazon.com will be disqualify entries using the review as a verified proof of purchase. 4. All participants posting book reviews on amazon.com as a means to verify purchase for Sweepstakes entry do hereby confirm that they have read all sweepstakes rules in advance and have not been coerced to provide a specific rating or make specific comments about Behind Closed Doors by K.F. Johnson and have therefore all comments and rating given are of their own volition without promise of monetary or non-monetary reward for the content of the posted book review. 5. Duplicate entries and/or attempts to submit multiple entries for the same paperback/ebook purchase will result in an automatic disqualification of both entries. Purchased paperback copies will be given a bonus additional entry by sweepstakes administrators if all other requirements are met. 6.The winner will receive 2 Field level tickets to the LEGENDS OF SUMMER TOUR on July 19th or 20th of 2013 at Yankee Stadium in the Bronx, New York featuring Justin Timberlake and Jay-Z. Taxes and/or express mail fees may apply. Airfare & transportation is not included to the event. Winner will be selected 6/17/2013 and notified via email or phone. Only 1 sweepstakes entry per person. Bonus entries for paperback purchases will be provided via sweepstakes administrators as long as all other sweepstakes requirements have been met and proof of purchase has been confirmed. Winner must verbally or electronically respond to notification of winnings within 10 days or forfeit winnings in total. 7. The sweepstakes winner will be announced via Facebook Fan Page and/or Twitter on June 17th 2013. 8. By submitting your entry, you are confirming that you have read and understand ALL SWEEPSTAKES RULES and understand that your entry must meet all of the requirements in order to be considered. You also understand that discovery of intent to deceive, and/or any violations of the stated sweepstakes rules will disqualify your entry and void any implied or stated commitment by the authors and/or any authorized representatives of the author to remit items promised/earned or otherwise implied available in the sweepstakes giveaway. 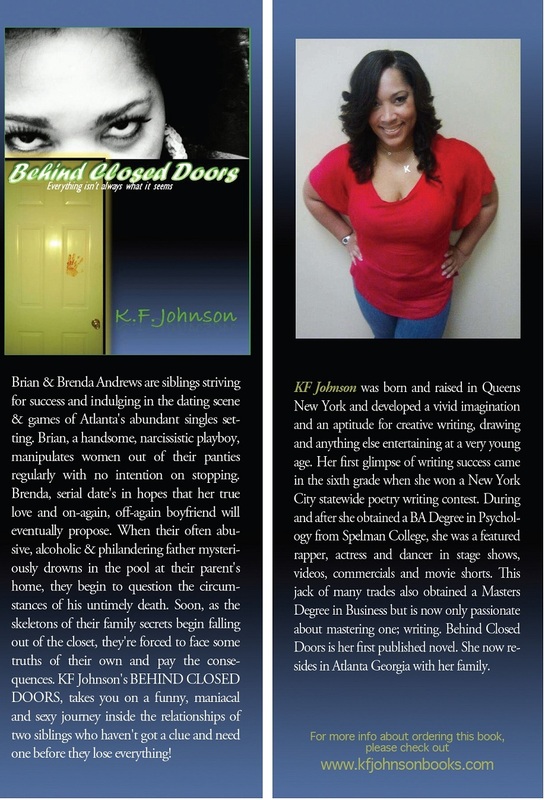 BEHIND CLOSED DOORS BY KF JOHNSON hit 50 Amazon Book Reviews! Finally Reached 50 Reviews on Amazon! Yes!!!! Guest whose book was #1 in promotional free book sales today? BEHIND CLOSED DOORS by K.F. Johnson had promotional free book sales for 3 days and skyrocketed to #1 for the first time during a promotional free book sale since it’s releas in July. Woohoo!!! #1 is #1 in my book! Thank you! I’m experiencing “Writer’s Book Marketing Block” Suggestions anyone? My book was steady in Amazon’s top 100 in its genre for the past 6 months since I published it, but as it gets older, I’ve found that I’m running out of new marketing ideas, which I’m sure is affecting the amount of exposure and thus the number of book sales. NOT GOOD! So today, instead of blogging advice or chronicling suggestions to others, I’m soliciting advice from the bloggisphere: What are your suggestions for free or inexpensive book promotions & marketing for a self published, suspenseful, urban drama genre’d (yes I know genre’d is not a TRUE word but I’m using it anyway) book that is 6 months old? Suggestions anyone?